This post has been a very long time coming! 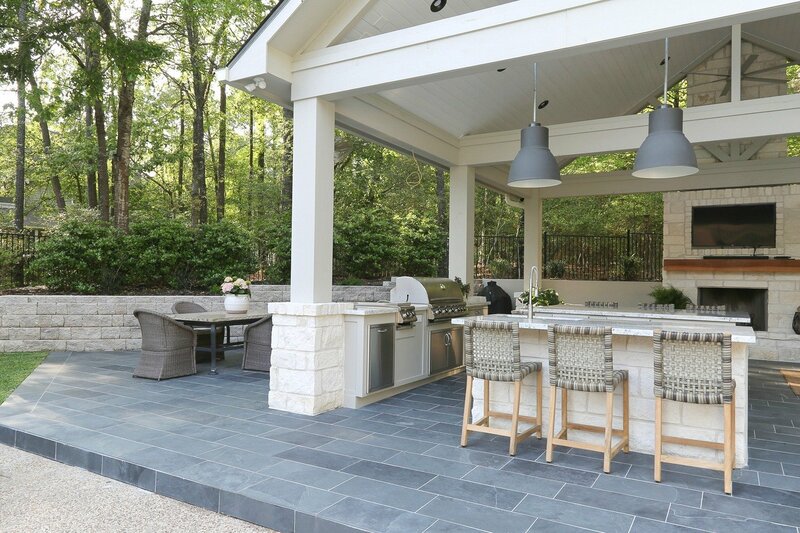 After many months of planning/designing and more than six months of construction, I can finally share our new outdoor kitchen, patio and pool project with you guys! Yes, I have been holding out from you guys and not sharing or even talking about this project on the blog like I normally do with all of my projects. 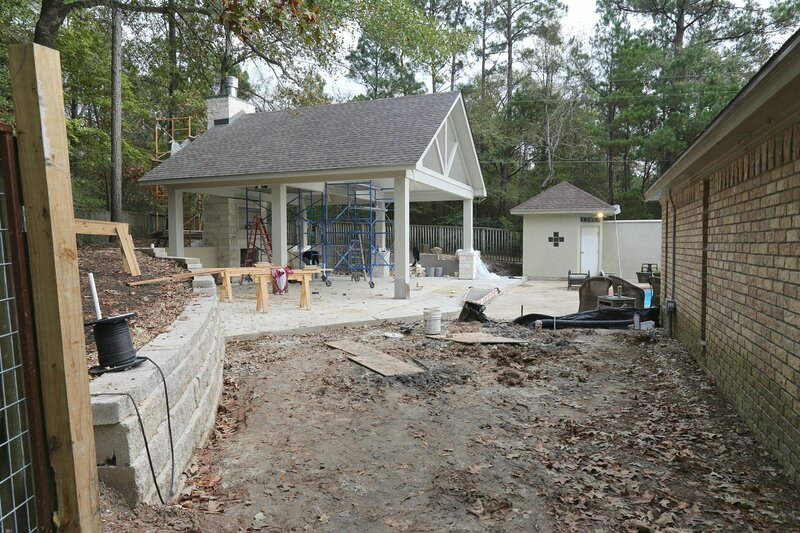 The truth is, we had a lot of issues to overcome going into the project, two hurricanes during construction and for several months all we had was a big mound of dirt. Not very exciting stuff to share! I decided that it would be best (and more inspiring for all us) to wait until the end of this big project and then over the next few weeks, take you back through each step of the process, go more in-depth about our design work/planning and all the other components. I want to share as much as I can to help those of you who may be planning an outdoor project yourselves. So let’s go back to the beginning for a moment and let me show you how our backyard looked before the construction started. 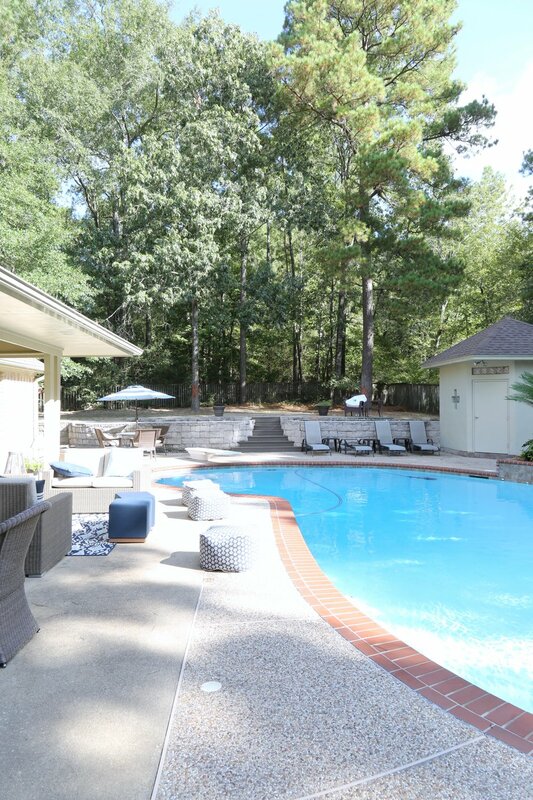 And after more than 15 years of staring at our backyard and wishing/dreaming, here’s the after!! Ahhhhhh…. So today I am mainly just going to show you a lot of pictures and as I mentioned, in the nest few weeks I will go more in-depth on each aspect of the project. However, there are a couple things I wanted to point out as you look through the images today. 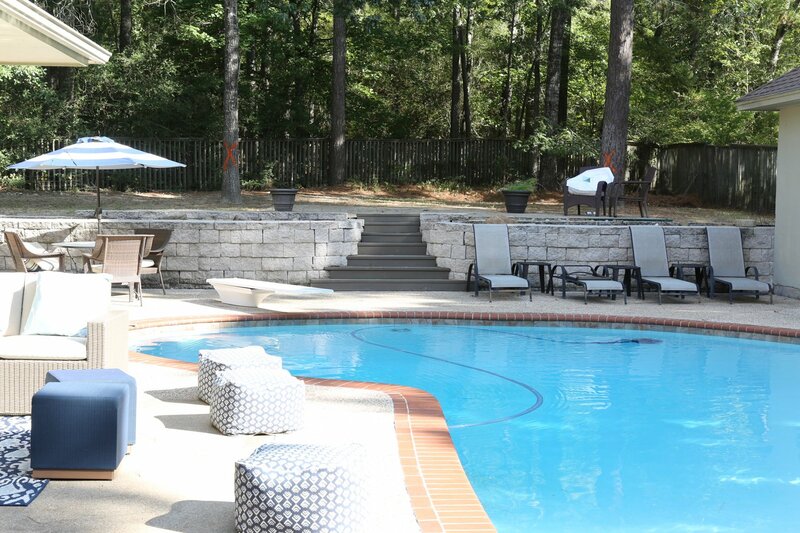 Because our upper level was more than four feet higher than our pool level, the whole backside of this project had to be a retaining wall. 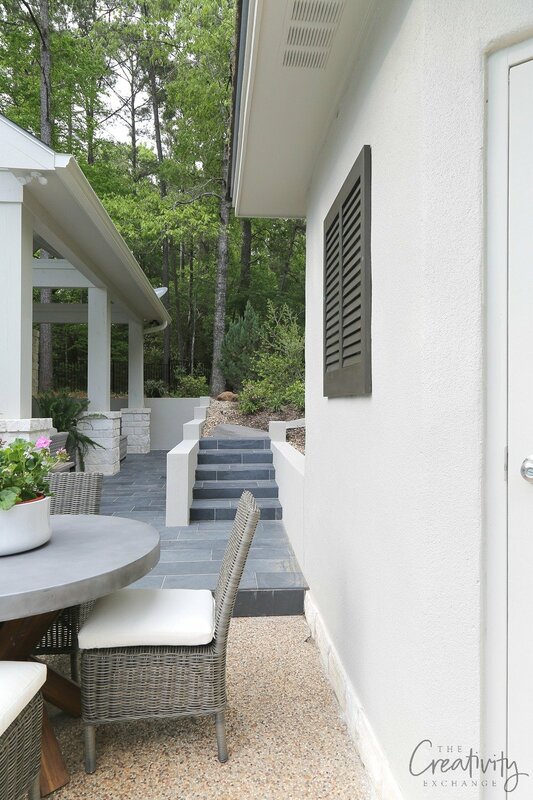 So all the stucco that you see on the sides,inside the pool house itself and fireplace is a retaining wall with French drainage behind the wall with a moisture sealed barrier. It was quite a challenge to build this while trying to alleviate any drainage issues that we could have. 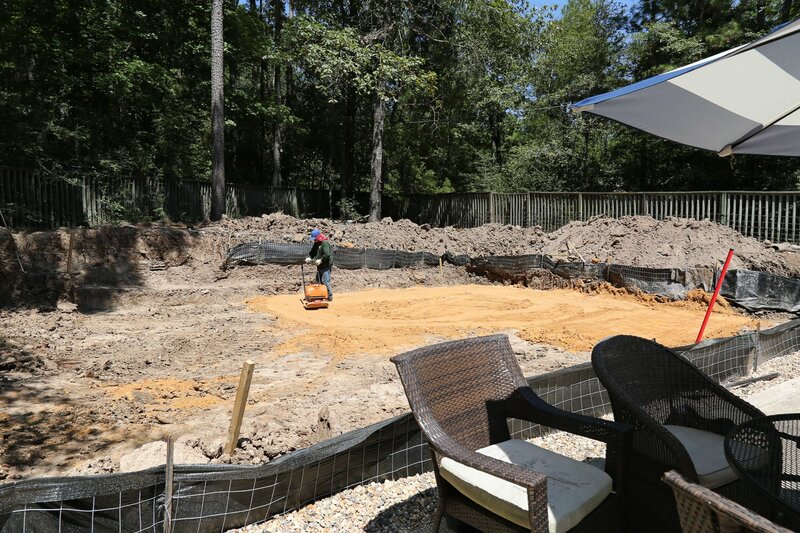 One of the biggest challenges that we had going into this project was that there was so much dirt that needed to be excavated and removed to level the yard (one step up) from the pool level. The dirt excavating alone took over four weeks to complete and that was daily excavating for eight hours and hauling off dirt through this little opening through our small gate. By the way, this was the only way to get into our backyard so this whole project was constructed through this gate and a road that was made through our front yard. 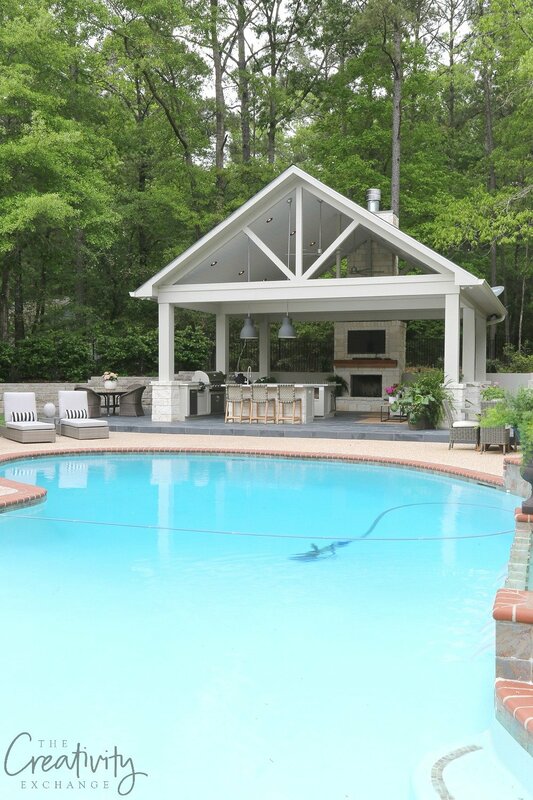 While I wanted the pool itself and pool house to both be on the same level, for drainage purposes, we opted to have the pool house one step up from the pool level. 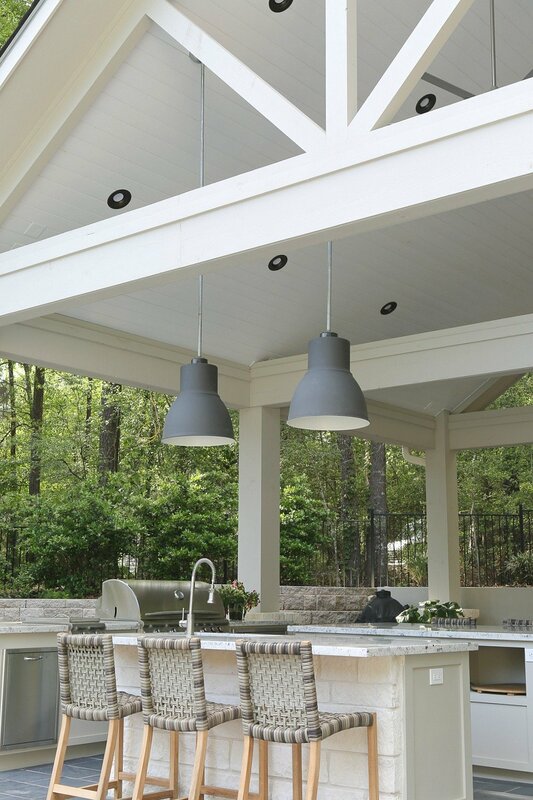 I wanted the pool house and the whole area to feel a little more modern than a traditional rustic type outdoor kitchen, so I did this by choosing lighter/airy paint colors like PPG Timeless Exterior Crystal Clear White on the house interior ceiling and a gorgeous light warm gray called Burmese Beige (PPG Timeless Exterior) as the main color that you see on the house and stucco wall. 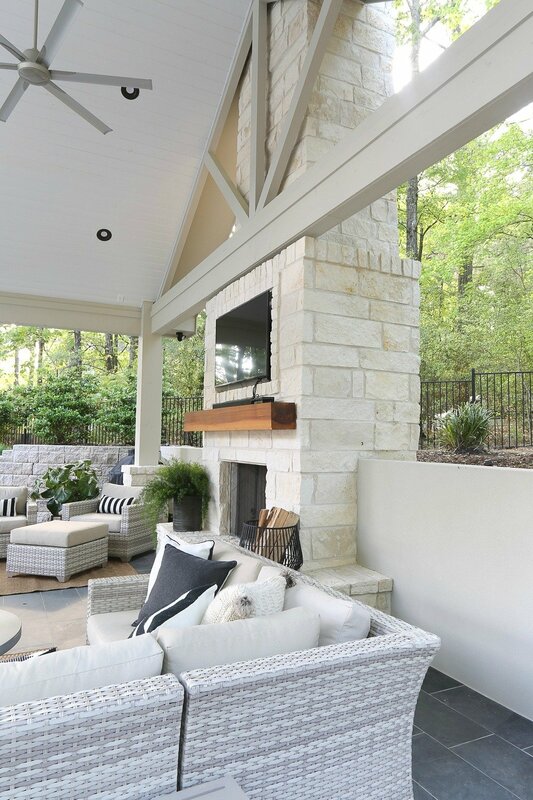 PPG Timeless Exterior is the most durable exterior paint I could find for this project and I will be sharing more about why I love this paint so much in the next couple of weeks. 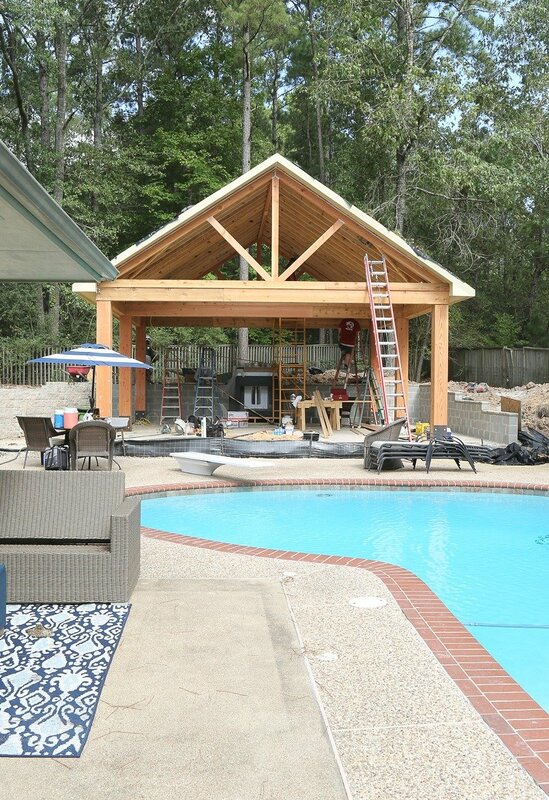 The house structure itself is 26′ x 26′ (from beam to beam) and that was as wide as I could have it without having to have a beam in the middle. 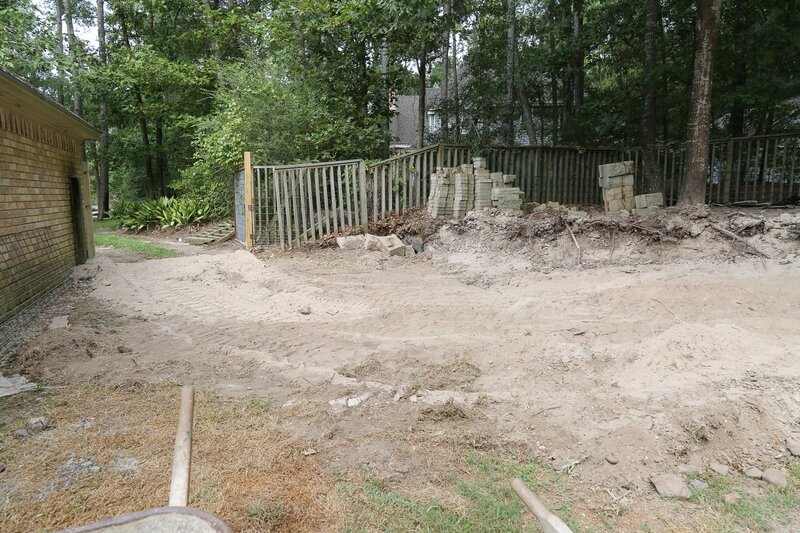 I wanted to utilize the rest of the yard so we extended the foundation to make a side patio as well. I spent months in the planning stage laying out the design for entertainment purposes and easy flow for when we entertain. 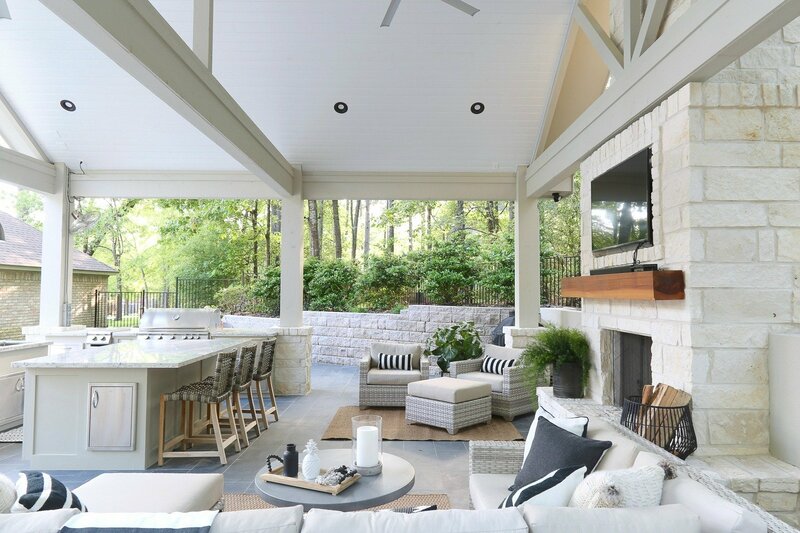 I wanted plenty of seating around the bars and islands and really comfortable seating in the open areas around the fireplace. 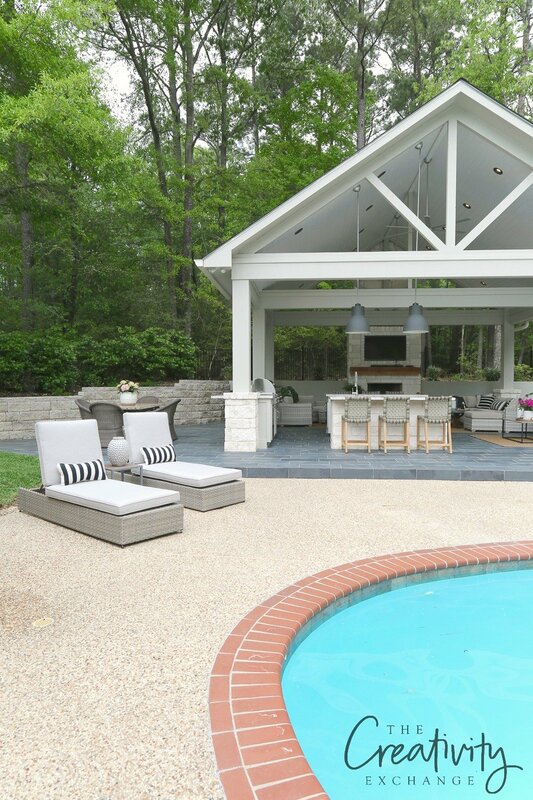 The base of the pool house, bars and fireplace are all limestone, which I really love! 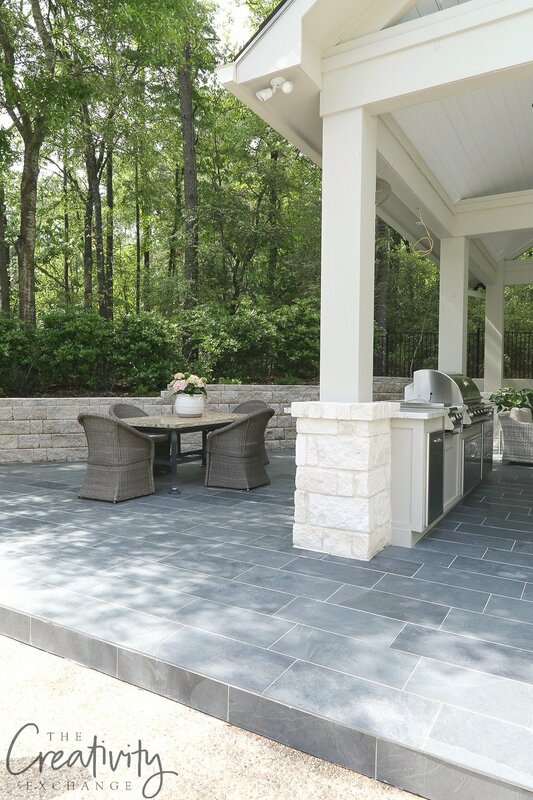 I had my contractor only use the whitest side of the stone to keep things light and airy because limestone can be orangy-yellow from the iron. I wanted lots of covered space for comfy seating and if you saw my post last week here, I shared a sneak peek of these areas and all of the furniture/decor sources. I am so excited with how it turned out and how cozy it is. 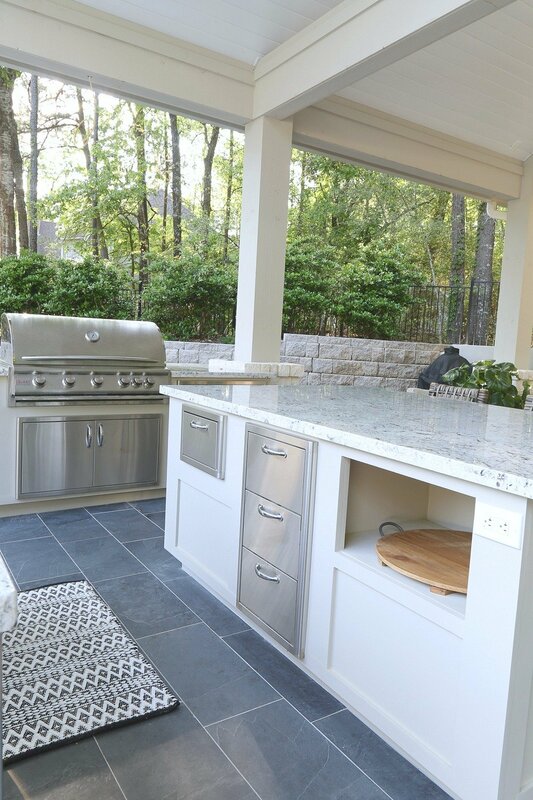 Next week, I will go more into detail about the outdoor kitchen part of this project because there is so much I learned and found that I wanted to share for those of you planning any size outdoor kitchen. 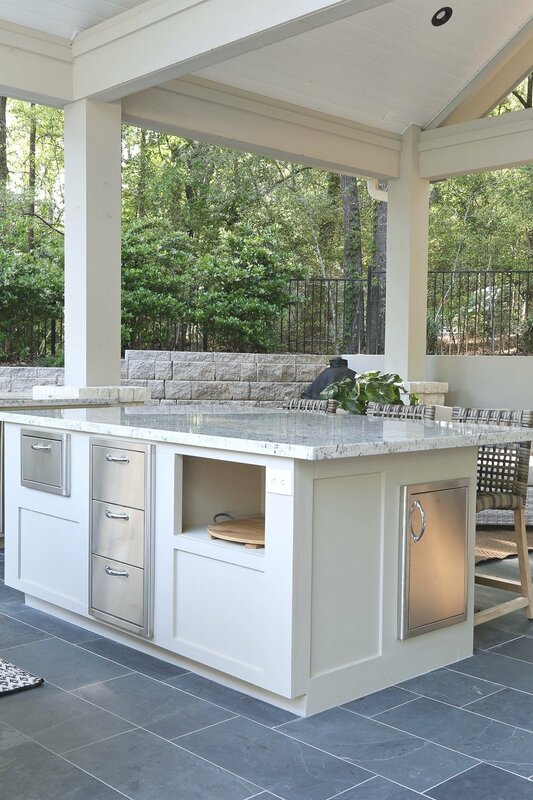 One of the most important things that I wanted in our outdoor kitchen was to have an oversized large kitchen island for sitting around, entertaining and cooking. 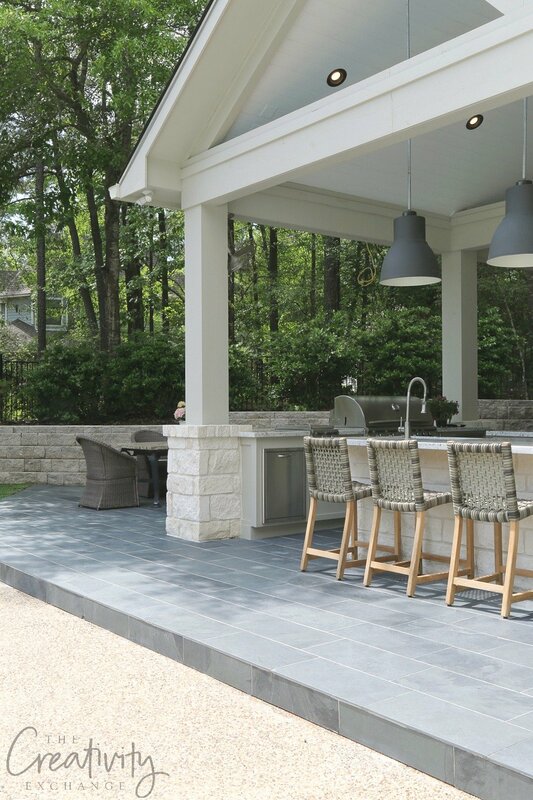 I loved how it turned out and we decided to keep things cohesive and we used the same beautiful color of the pool house (PPG Timeless Burmese Beige) on all the cabinetry. I can’t wait to share more of this project with you guys in the next few weeks. 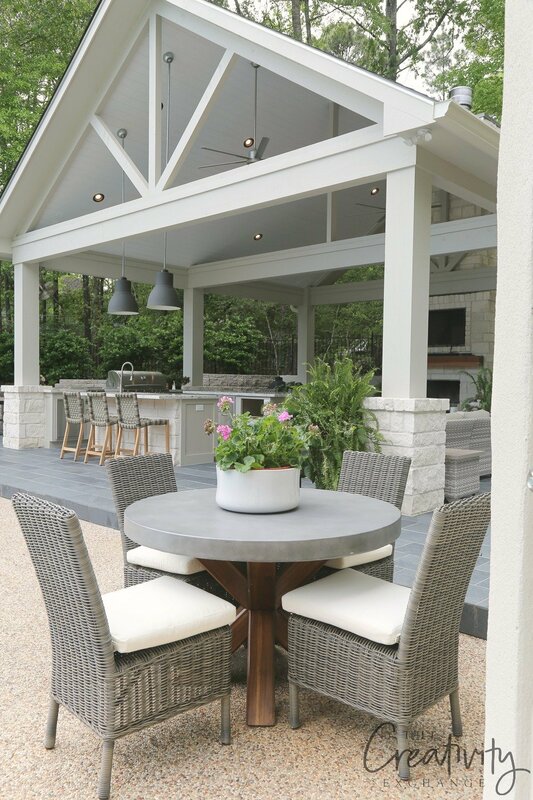 I plan to share everything from the planning, to the construction to even some of the smaller details that we incorporated in our outdoor dream space. 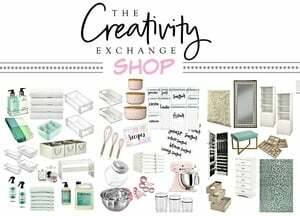 « Joanna Gaines Paint Line Now Stocked at Target! What is your flooring? It’s beautiful. We have just moved in to a new house we have been building about 2 months ago. 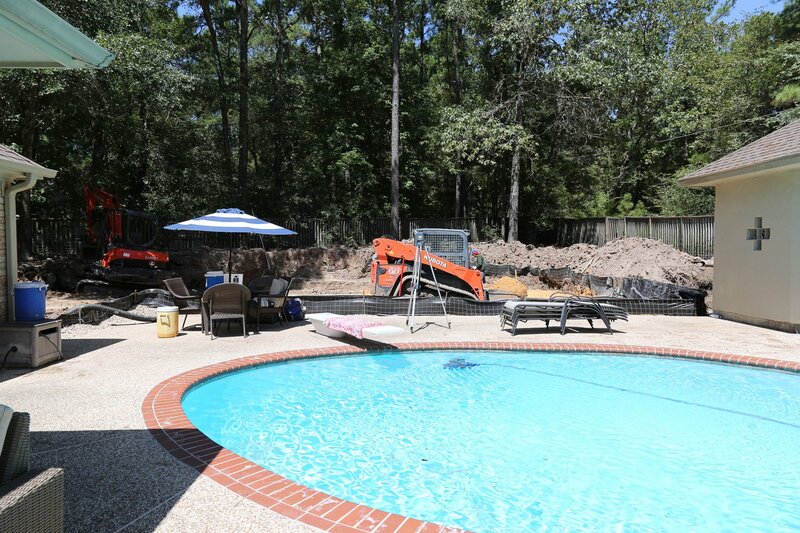 We are beginning the process of building a pool TODAY. Your timing is perfect. That is besutiful !! Great job!! 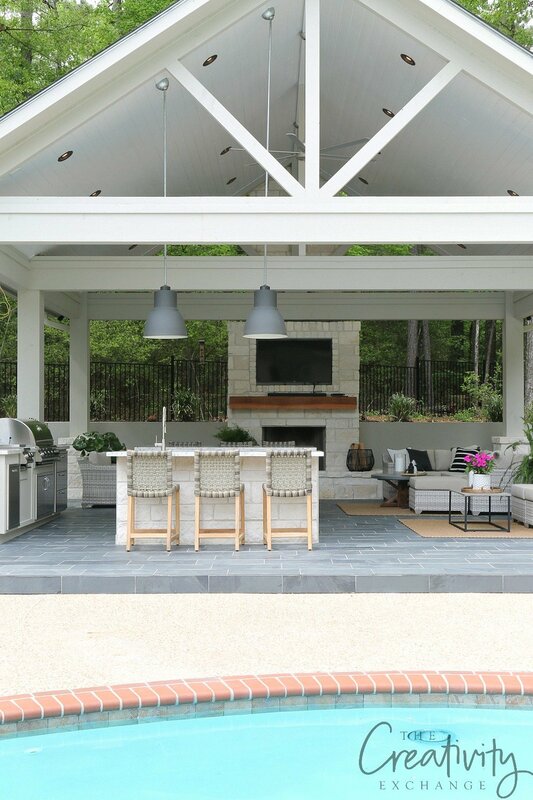 Best out door space I’ve seen . Creativity at its best . This looks absolutely amazing and I have been waiting for this reveal! You are going to live in this space and never leave! It looks so awesome. 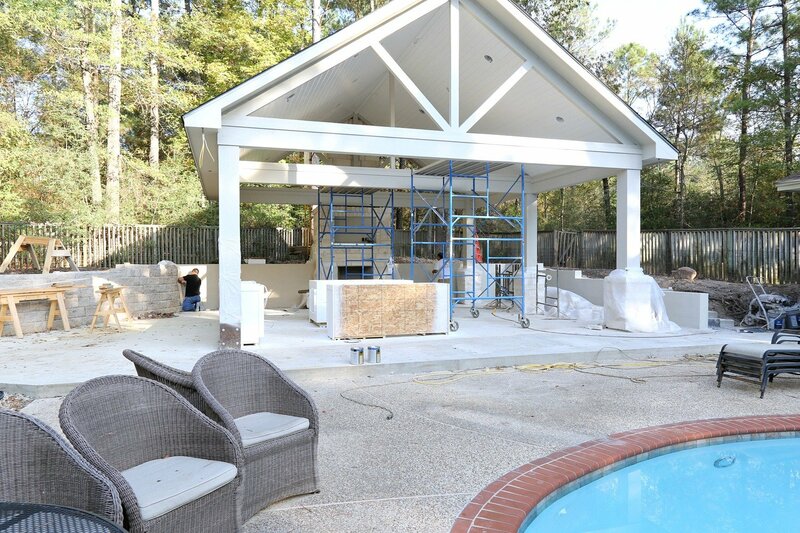 We are putting in a pool as we speak too & just love your outdoor kitchen.. Great job! what kind of wood (and where did you get it) did you use for your mantle? This is exactly what I want for our indoor fireplace. We are in FL and out fireplace is white coral. This would be perfect. Thanks. What a beautiful, relaxing space. I could see it as a party for 100, as well as a small cocktail party with the girls. In addition to the new building, it looked like you resurfaced your existing exposed aggregate concrete walkway around the pool – what did you use? It’s so pretty! Since you live in hurricane country, and hurricanes blow sideways – do you have any emergency covers for the TV? It seems strange that the water could reach that far into a covered structure but…. The tv is actually inside the fireplace. As the fireplace was being stoned, a box was made for the tv so it would be protected. However, in hurricane weather, you’re right, we could potentially have some damage. 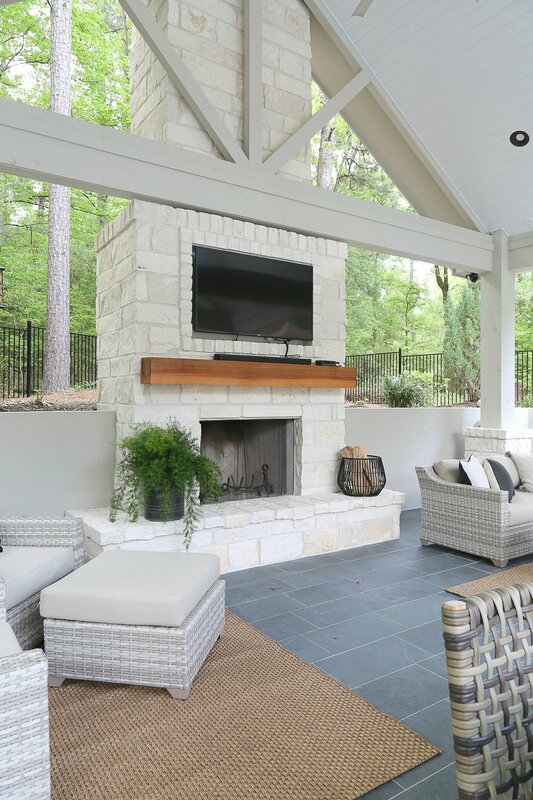 We were told that most people here in East Texas do not buy the expensive outdoor tv’s but just get the cheapest ones on sale at Walmart and if it’s damaged, it’s not as bad as replacing the $2,500 outdoor ones, so that’s what we did. We actually just had a very severe storm last week and it rained sideways for hours and I was shocked that the tv was not damaged! I just knew after that storm that it would be ruined but it wasn’t. Even the Bose Soundbar was fine! Absolutely stunning. Can you please share the stone you used on the counter tops. Thanks! WOW!!! Just WOW! Beautiful job Cyndy! 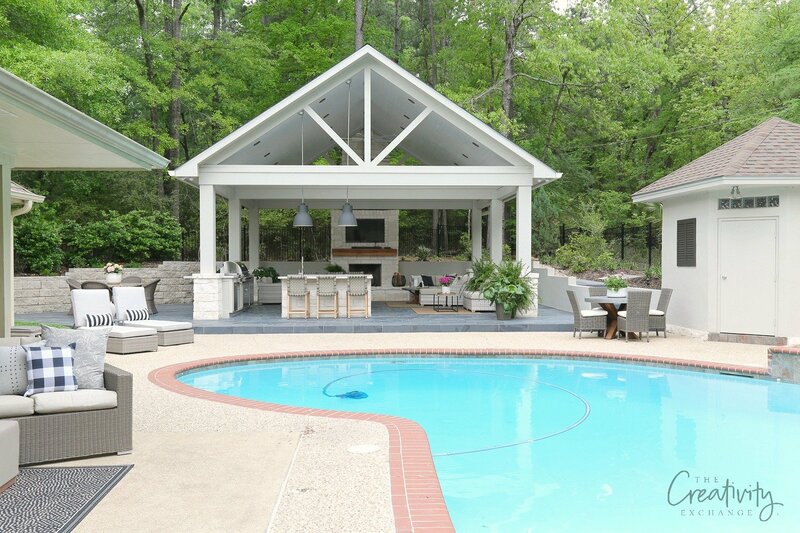 It is beautiful, Cyndy and I know you and your family and friends will thoroughly enjoy it. 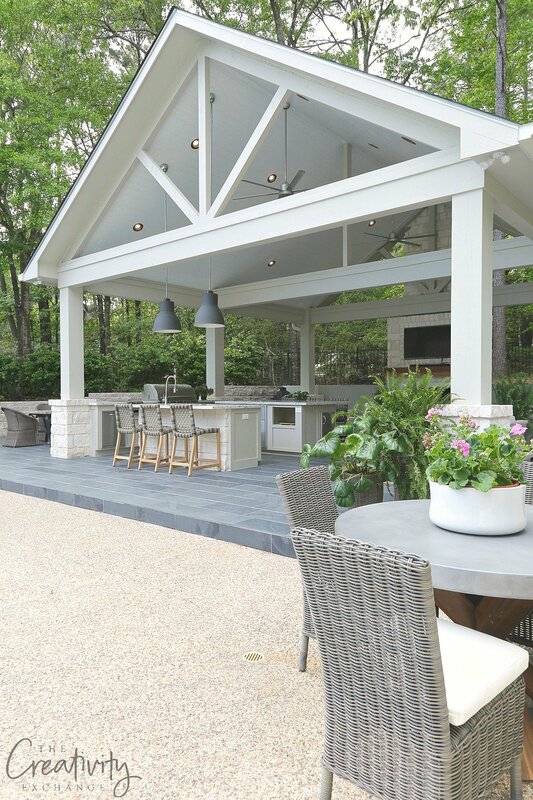 This is the most beautiful outdoor space I have EVER seen – truly amazing! I have been pouring over these pics for the last 45 minutes! I am pinning EVERYTHING! 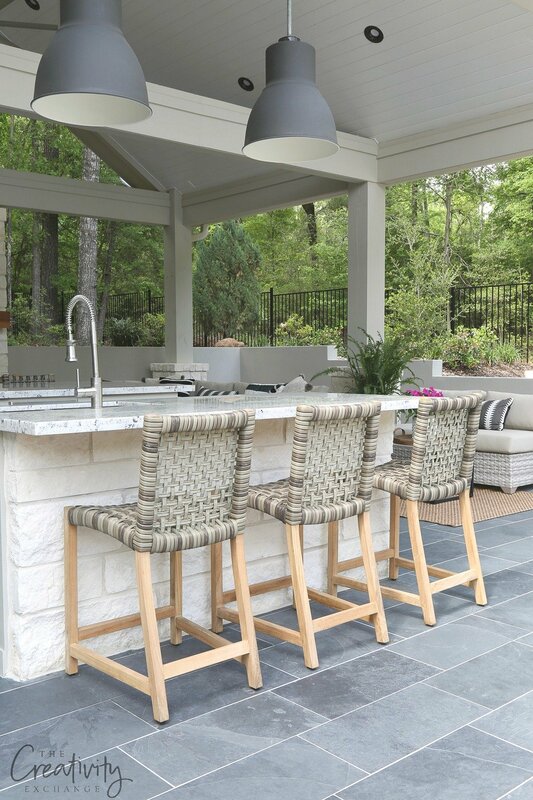 The bar stools are just divine! Would you please be so kind as to provide some detail on those? I apologize if you’ve already mentioned it. Are they also by TK Classics? Thank you. Dang! Good job! 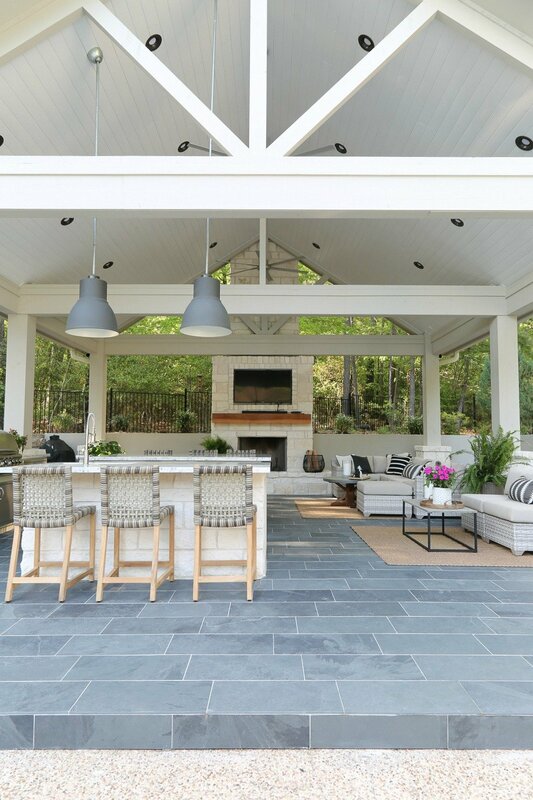 What an amazing space! This is simply amazing! 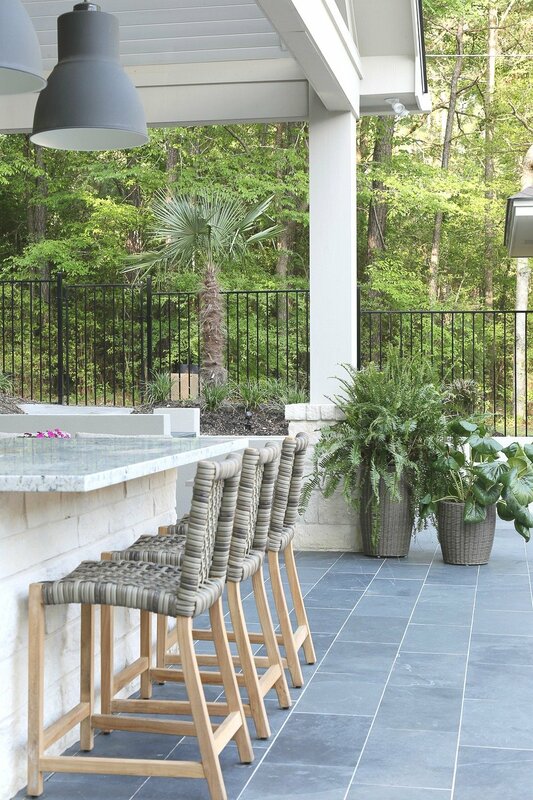 Would you being willing to share where you purchased (or the brand) the bar stools, indoor sofa/sectional and round dining table and chairs? Love!!! 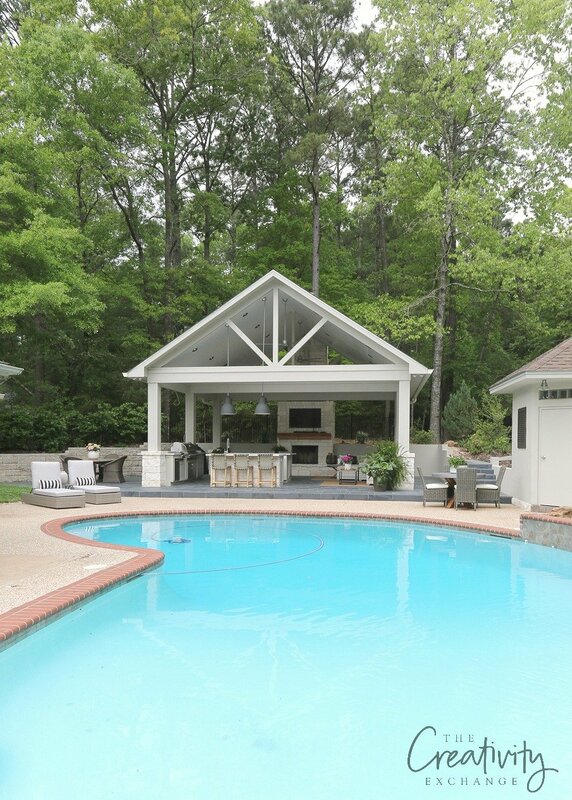 What are the dimensions of your pool house? 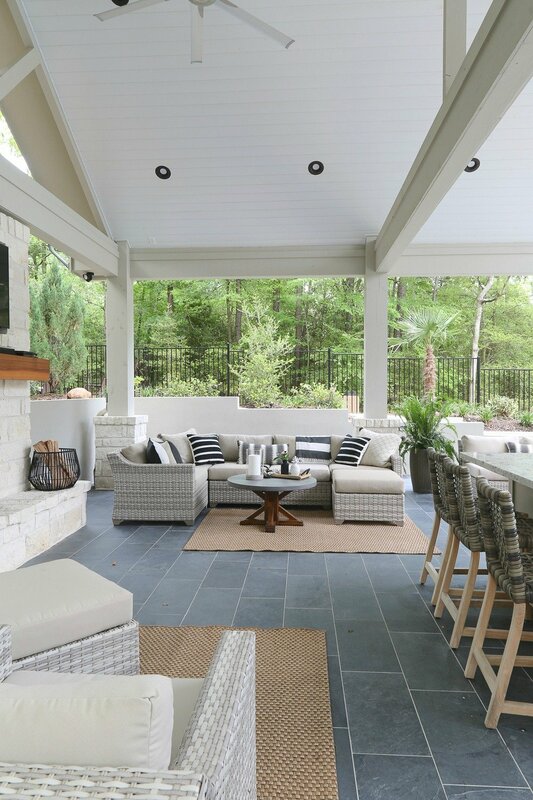 This space is perfect!!! I saw where you mentioned the tile source. 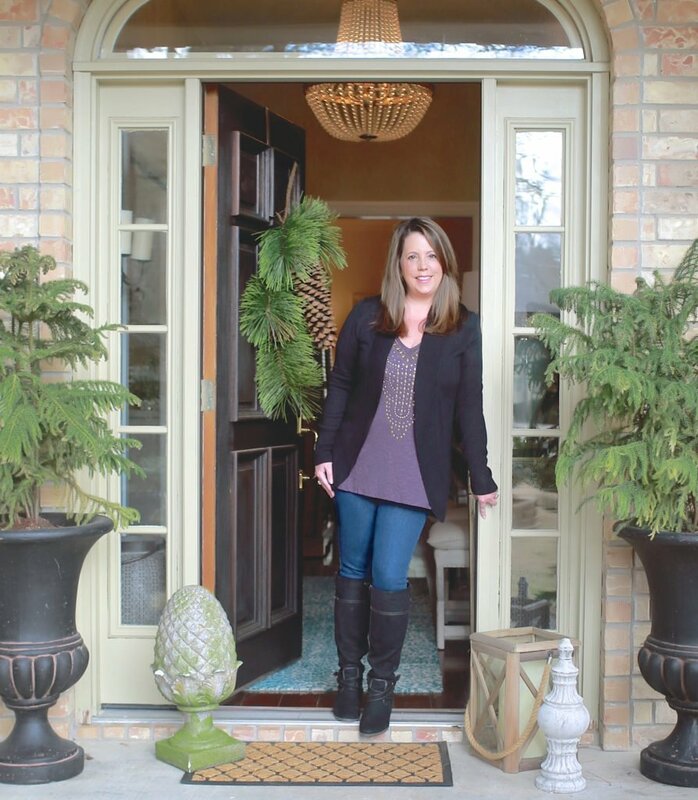 Was this a Home Depot type purchase or a tile specialty store? What a beautiful space!!! 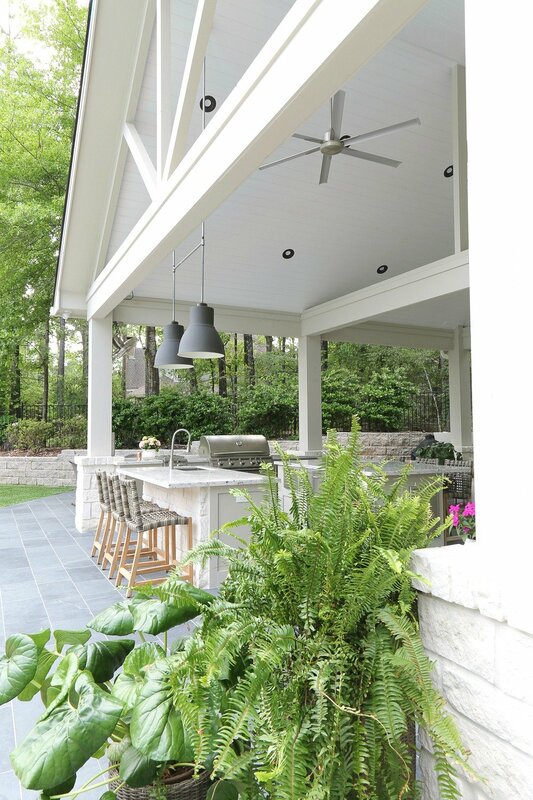 I am so happy to find these images because I am drawing plans now for our covered patio. The cabinetry is lovely. Where are they from? I presume they are designed for outdoor use? 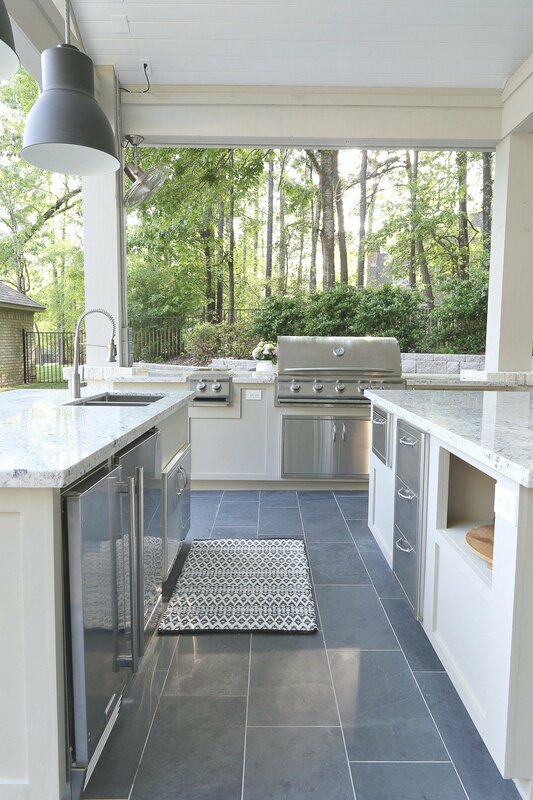 My husband thinks we have to do stainless steel cabinets outside and I would much prefer something like yours. Thank you so much! Gorgeous! I am looking for very similar couch. Whete is the furniture from? Absolutely stunning!! From the design to the furnishings! What a beautiful place to enjoy. Hello. Beautiful Ramada! Just curious what are the total dimensions (WxLxH)?? 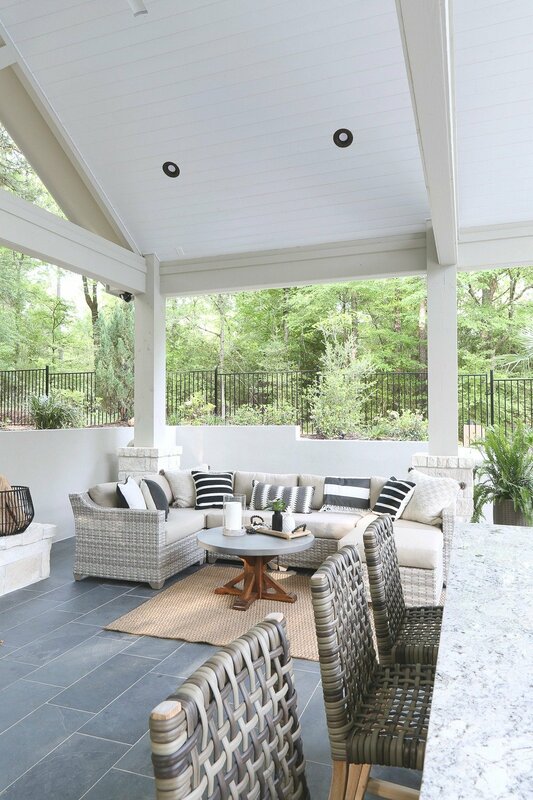 I love this patio and have been using it as inspiration for ours that is currently being built. I am wondering if you can share where you purchased your ceiling fans? Looking for some but not sure what I want? Do you have any suggestions?